Commissioned c. 1907 by the sitter, Hugo Reisinger [1856-1914], New York; by inheritance to his son, Curt H. Reisinger [d. 1964], New York; gift 1957 to NGA. Loan for display with permanent collection, Birmingham Museum of Art, Alabama, 1986-1994. 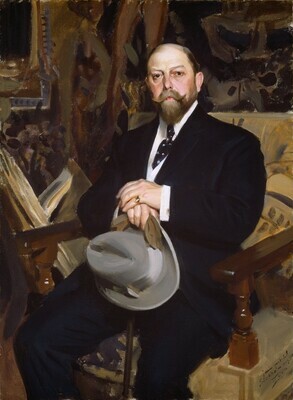 Zorn: Paintings, Graphics, and Sculpture, Birmingham Museum of Art, Alabama; Dixon Gallery and Gardens, Memphis; Museum of Fine Arts, St. Petersburg, Florida, 1986, no. 22, repro. Anders Zorn, Prins Eugens Waldemarsudde, Stockholm; Göteborgs Konstmuseum, Göteborg, 1994-1995, unnumbered catalogue, repro. Loan for display with permanent collection, Birmingham Museum of Art, Alabama, 1995-present. European Paintings and Sculpture, Illustrations. National Gallery of Art, Washington, 1968: 127, repro. European Paintings: An Illustrated Summary Catalogue. National Gallery of Art, Washington, 1975: 378, repro. European Paintings: An Illustrated Catalogue. National Gallery of Art, Washington, 1985: 442, repro.